The state of Israel is a home for a widely diverse population from many different ethnic, religious, cultural and social backgrounds; a new society with ancient roots, which is still coalescing and developing today. Israeli sport, maybe more than any other cultural phenomenon, has changed radically since the establishment of the state of Israel in 1948. Over the past six decades, Israeli sport has evolved from an amateur hobby of a few ‘sports freaks’, to a passion of the masses. The transformation to a major cultural phenomenon is the result of general developments in Israeli and international society. The aim of the book is to shed light on those processes that shaped the Israeli sport arena. 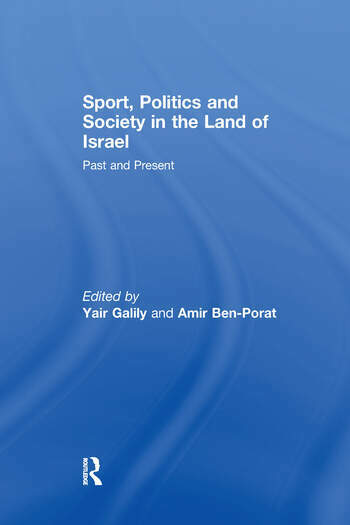 Following the steps of numerous research perspectives, that considers sports as "text" within a socio-historical context, this book deals with the development of Israeli sports in Palestine and, later, the State of Israel as a text (or a narrative) which was contingent on the socio-historical context. In seeking to comprehend these processes, this book is divided into three parts. The Palestine period, the early stage of statehood, and the "matured" period which began in and around the early 1980s. Each period is narrated by the major participants and the major political-economical parameters which, as it is argued, shaped Israeli sport. This book was published as a special issue of the Israeli Affairs. Yair Galily (Ph.D. Leicester) is a sport sociologist and holds academic degrees from universities in Israel, the USA and the Great Britain. He teaches at Zinman College of Physical Education and Sports Sciences at the Wingate Institute and is founder and head of the Research Unit in the Israeli Football Association (IFA). Amir Ben-Porat (Ph.D. Strathclyde) is a professor of sociology in the College of Management in Rishon Le'Zion and the author of five books on soccer and society in Israel.